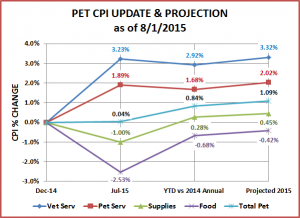 In June, the volatility in the Pet Market segments appeared to be calming down. All segments had moved up slightly for 2 consecutive months. This was expected for the Service Segments but represented a welcome change for Supplies and Food and put Total Pet back on Plus(+) side for the year. 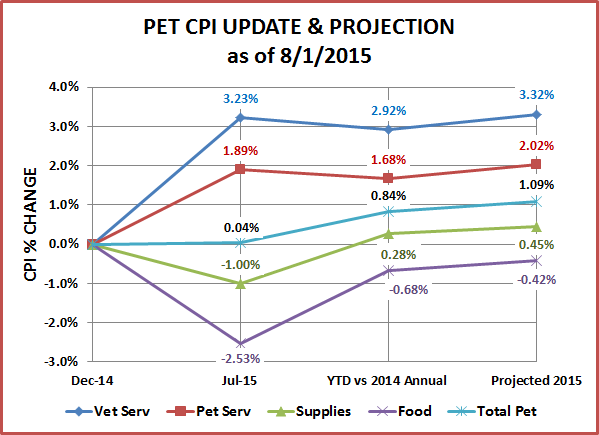 In July we usually expect the Service Segment Prices to flattened out and prices to fall in Food and Supplies. The amount of this drop was critical. If it was less than last year, then the likely decline in Food prices for the year would be mitigated…and Supply Prices may actually turn positive…moving away from deflation. Then in July the Food Prices went “off a cliff” with the biggest single monthly drop since they began keeping records in 1997 – down -1.95%. This also generated a record monthly drop in the Total Pet Industry of -0.64%. Food has been consistently down since December but the record drop in July was three times as big as the decline in July 2014. The expected drop in Supply prices was only half as steep as 2014. Veterinary and Non-Veterinary services are generally almost flat from June to July. 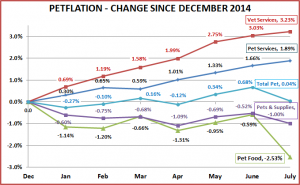 This year they moved up 0.2%, which is small but only accelerates the inflation in these segments. The July drop in the Total Pet Market Prices was also the biggest single monthly drop since they began keeping records in 1997. The increase in the Service prices actually mitigated the impact of the precipitous drop in Food and kept the overall prices about even with December 2014. Next, let’s look at the monthly history over the last 21 months to put this month’s data into perspective. July of 2015 and July of 2014 are outlined so you can see the journey over the last 12 months. July generally brings price decreases in food and supplies. However, the severity of the drop in Food was unprecedented. Overall we are about 1.0% above the pricing of July 2014. Food is the only segment with prices lower than a year ago. But…it is the largest segment, so it is a major “driver” in the total market. Now, let’s take a slightly different look at the data. 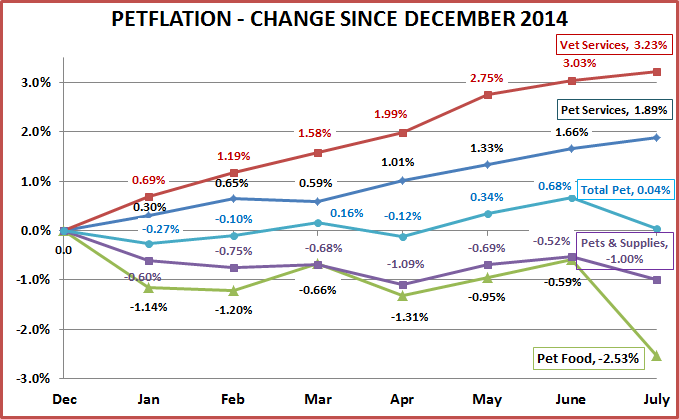 The chart below includes a comparison of the 2015 YTD CPI to the 2014 annual CPI and also includes an updated projection of the annual CPI change for 2015. August or September could produce another drop but if we get the normal Fall increase…. 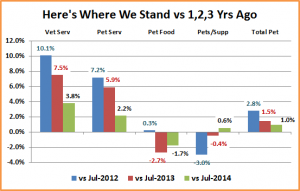 Pet Food – This largest segment is the headline news. July produced the biggest single month price drop in history…-1.95%. Along with the -1.17% drop in January, prices are now down -2.53% for the year. Fall generally produces monthly increases in Pet Food prices but it seems unlikely that they can recover completely…plus December often brings a drop. Therefore, 2015 is projected to be the second consecutive year of falling food prices…down 0.42%. The competitive pressure is getting intense as today’s consumer actively searches for value. Let’s put this price change in “historical” perspective. For most years since 1997 Food Prices have risen 1-3% annually. In 2007, a series of Pet Food recalls began. 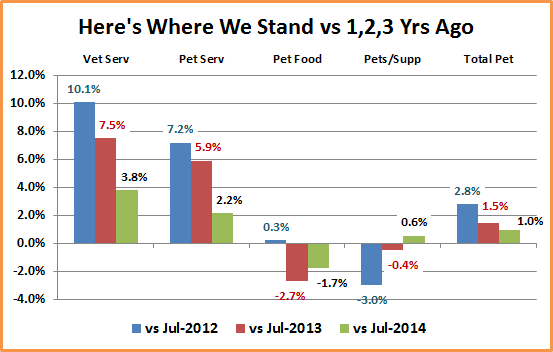 From June of 2007 to July of 2009 Pet Food prices rose 23%…yes, 23% in 25 months. It seems that the retail product mix and/or product make up was substantially changed during this time. There were also other factors coming into play, as the U.S. was in the heart of the biggest recession since the “Great Depression” in the 1930’s. In Mid-2009 prices turned downward and the annual Pet Food CPI dropped -0.4% in 2010. The next 3 years saw moderate increases of 2%. Then in December of 2013 Food prices started down again and have not recovered. The current prices are roughly equal to those in the summer of 2012 – 3 years ago. The recent recession is widely regarded as a “turning point” in the behavior of the U.S. consumer, with value becoming THE major factor in their purchase decisions. This invariably produces competitive pricing pressure which we are seeing in this major Pet Industry segment. Unlike other segments, “buying” Pet Food is not discretionary. It’s a necessity. Therefore, most consumers are going to be greatly influenced by retail price. 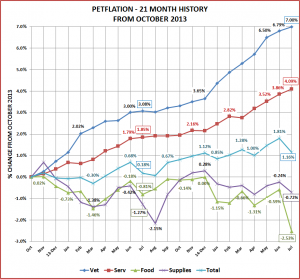 Pets and Pet Supplies – Since I first began writing about Petflation, the lead story has invariably been the “deflation” of Supplies due to increased commoditization of product categories. With July’s price drop only being one half of last year’s, it seems increasingly probable that supply prices will increase this year for the first time since 2011 and only the second time since the recession…Up 0.45%. It’s not a sure thing. We should see another price drop in either August or September and possibly one in December. The results in December may be critical for a positive year…then we need to string a few positive years in a row…which hasn’t happened since the recession in 2009. NonVet Services – July’s price jump was a bit of a surprise. Increases in this segment have been moderating. We now expect prices to increase 2.02%, which is slightly below 2014 and significantly below other recent years. There is an indication from the Consumer Expenditure survey that the years of large increases have started to slow real growth in this segment, specifically limiting it to households with an income of over $120K. Veterinary Services – The Veterinary Petflation rate is on track for another year over 3%…Up 3.32%. The continued high inflation rate has substantially reduced the rate of increase in the amount of Veterinary services and limited the growth to households over $120K in income. Households under $50K were actually showing a substantial decrease in spending according to the U.S. Consumer Expenditure survey. You can readily see the reduced inflation rate for Services and the turnaround for Supplies. 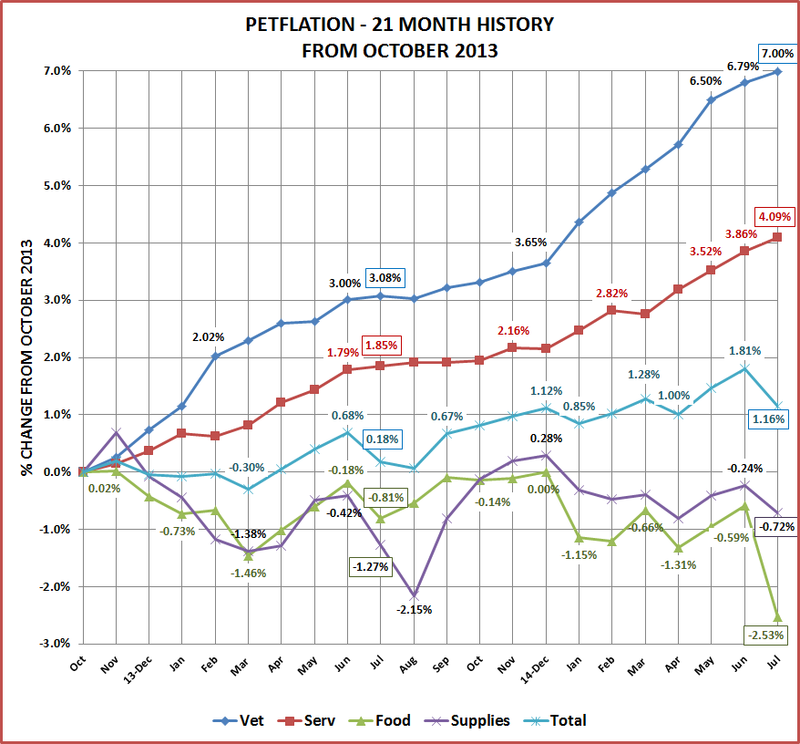 You can also see where the big problems lie…in accelerating inflation in the Veterinary side and the substantial deflation in the Pet Food Segment. We’ll keep you up to date in the critical last months of 2015.